Note: This is the first post of a longer series exploring the role machine intelligence will play in the backbone industries that constitute the vast majority of global GDP. In this first post, I will situate the present age in historical and theoretical context, before diving into particular sectors of the economy in subsequent entries. There’s little doubt machine intelligence has the potential to generate vast amounts of global welfare and higher standards of living in the coming decades as it transforms healthcare, agriculture, transportation and other key industries. At the same time, it raises profound questions about the future of work and justice more broadly, as algorithms displace labor. I don’t have the policy expertise to address its impact on future labor markets, but hope others continue to urgently address the issue so that society is as fair as it is automated. 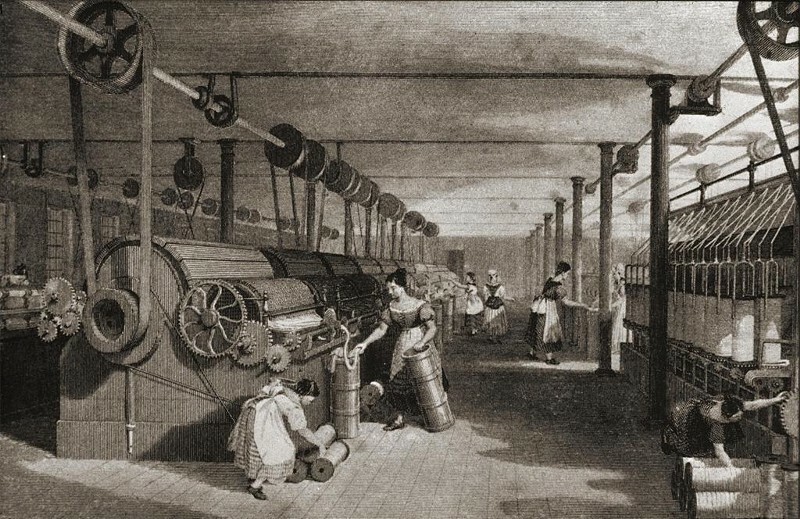 In switching to electricity from steam power, in concert with continuous-process and batch-production methods, the benefits of automation in the 20th century largely accrued to more skilled production and white-collar labor. This skilled labor has been, to some extent, in a constant race with machines (Frey and Osborne, 2013). 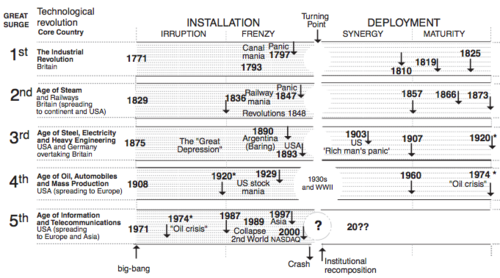 In her research on financial crises, Carlota Perez offers a useful update on Schumpeter (made famous for his thesis on “Creative Destruction”), providing a useful framework for understanding technology diffusion in society. 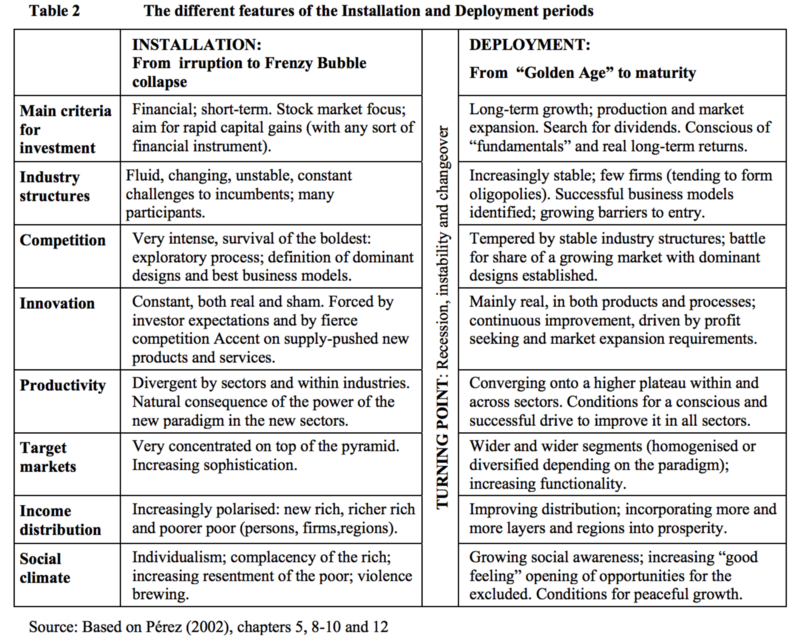 Broadly speaking, the adoption curve separates into two phases: installation and deployment, accompanied by the whipsaw of boom and bust finance. Per Perez’s 2013 paper, we’re located somewhere in the maw of the information age, a phase inaugurated by Intel in the early 70s. It seems reasonable to question whether the current machine intelligence revolution represents a natural extension of the so-called Information Age revolution or stands apart as its own wave. It seems each previous capital cycle revolved around some new way of manipulating matter and energy (e.g., water power, steam, oil, electricity) into a production factor. Nowadays, bits have replaced barrels of oil, for example, as the key industrial metaphor. Yet, it seems entirely possible the next revolution won’t necessarily involve a fundamental new way of harnessing and configuring energy and matter, but instead shape bits into new abstractions. If we wait patiently for the bit’s successor before delineating a new cycle, we may mis-judge machine intelligence as the understudy when in reality it performs the lead role. 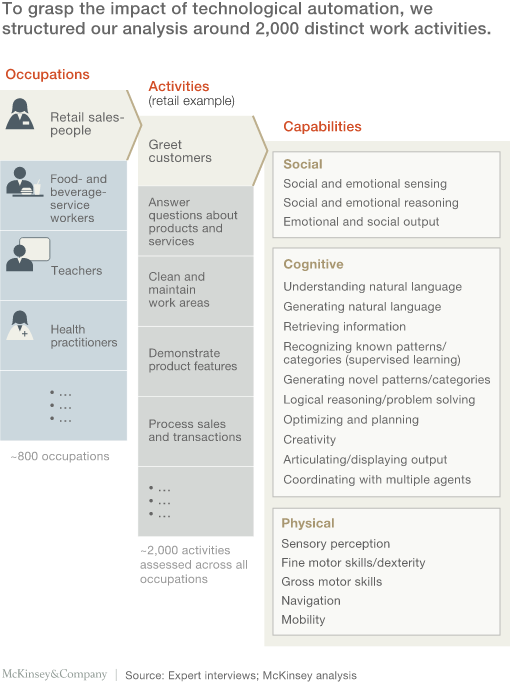 To better assess the role of machine intelligence in the broader capital cycles and game out the effects of automation in the coming decades, it’s helpful to divide work and tasks in two dimensions, per Autor et. al. 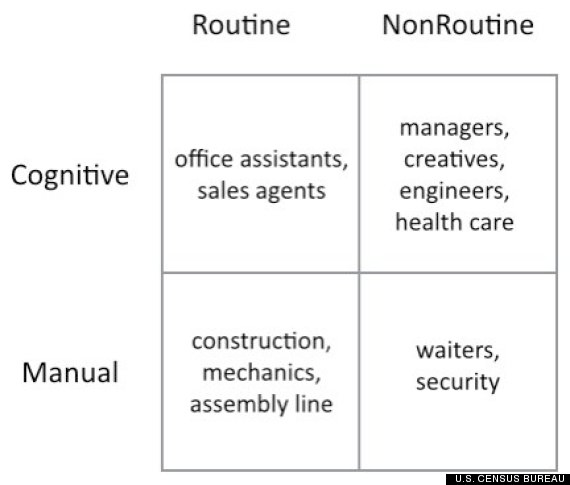 (2003): routine and non-routine; cognitive and manual. “Abstract” tasks, “which require problem-solving, intuition, persuasion, and creativity” per Autor (2013), which itself further divides into those involving formal analytical skills, e.g., engineering and medicine and those which rely on interpersonal and managerial abilities. 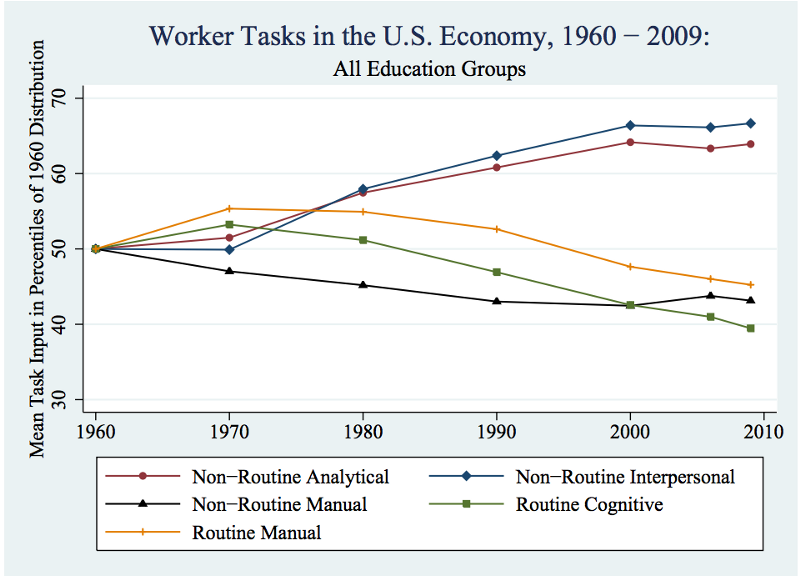 As the chart above illustrates, from the 1980s forward, routine tasks fell into decline, as computer inputs substituted for labor. At the same time, non-routine analytical and interpersonal labor began its ascent to present day highs. As computers displaced labor from routine work, non-routine manual work reversed its secular decline starting in the 90s (Autor, 2013). According to our analysis, fewer than 5 percent of occupations can be entirely automated using current technology. However, about 60 percent of occupations could have 30 percent or more of their constituent activities automated. In other words, automation is likely to change the vast majority of occupations — at least to some degree — which will necessitate significant job redefinition and a transformation of business processes. As part of their paper, Osborne and colleagues hypothesize three key engineering bottlenecks standing in the way of near total automation. 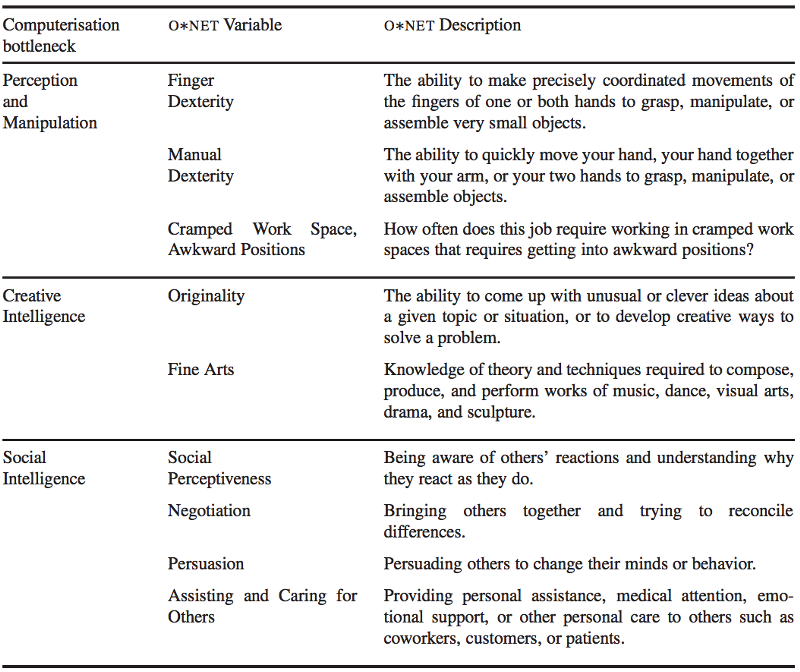 These are perception and manipulation tasks, creative intelligence tasks, and and social intelligence tasks. With that rather academic background out of the way, the following entries in the series will focus on AI’s future role in the major global industries and the potential for AI-focused startups. As it relates to AI, I will use some of the following questions that I believe are most material when exploring the impact of such technology. Will the technology Augment or Replace a series of tasks? Does it promise Efficiency Gains or New Capabilities? Is it pure Software or does it involve a Hardware component or both? Does the product offer passive Prediction or does it take Action? Does it accrue a Defensible Dataset over time? How prevalent are Data Collection Tools (e.g., sensors) in this industry? How mature is the industry in terms of “Big Data” infrastructure adoption?